Last season, Liverpool suffered an incredible 18 hamstring injuries after Jurgen Klopp took over, and with the new season only three games old, Klopp's players are dropping like flies yet again, with Philippe Coutinho the latest victim of the infernal hamstring curse. "Philippe Coutinho is a fitness doubt for Tottenham [after] complaining about tightness in his hamstring. Coutinho only took part in light training on Thursday". “The muscle was a little stiff. He felt something so we didn’t want to take a risk [against Burton]. We left him out of training. It is not a situation to take any risk". This is no surprise whatsoever. I've argued for months that Klopp's 'heavy metal' approach is outdated, and counter-productive, and the endless run of injuries arguably supports this contention. In my view, Klopp has learned nothing from his time at Dortmund, where his 'football madman' regime decimated BVB, and created one of the biggest injury crises the Bundesliga has ever seen. SUBS: Benteke, Enrique, Origi, Sakho, Ibe. 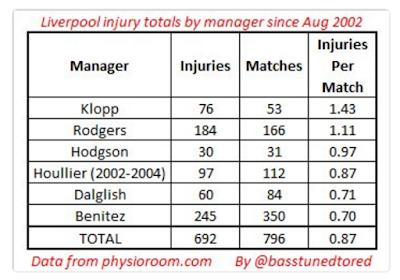 Liverpool also suffer other regular injuries under Klopp, and although it's only August, the Reds currently have 8 players on the injury list, with Mane, Grujic, and Matip also suffering issues in recent weeks. Plus, in a strange turn of events, Origi is somehow a doubt for Spurs due to cramp (!) Since when did cramp cause players to miss games? Only under Klopp, it seems. Amen. The moral of this story? Expect more injuries, starting at Spurs this Saturday. My money is on Sturridge, Lovren, or Wijnaldum. ^ £40m-rated. Described by Klopp as a 'genius'.